Covered patios come in many shapes and sizes and are a desirable amenity for single-family rentals. One of the most common coverings is the versatile pergola, which offers a natural look and an outdoorsy feel for many years to come. Pergolas are time-tested wooden open-air structures that can be installed over patios to provide shade and a cozy place to gather on a cool spring evening or warm summer day. They are a backyard amenity that surely will be welcomed by your residents. Vertical posts support a network of cross beams and a sturdy open lattice, usually cedar, which can be covered or left open to the elements. Many companies offer pre-manufactured kits priced anywhere from $1,500 to $5,000 and others will build to site specifications. Larger applications can run $10,000 to $15,000. 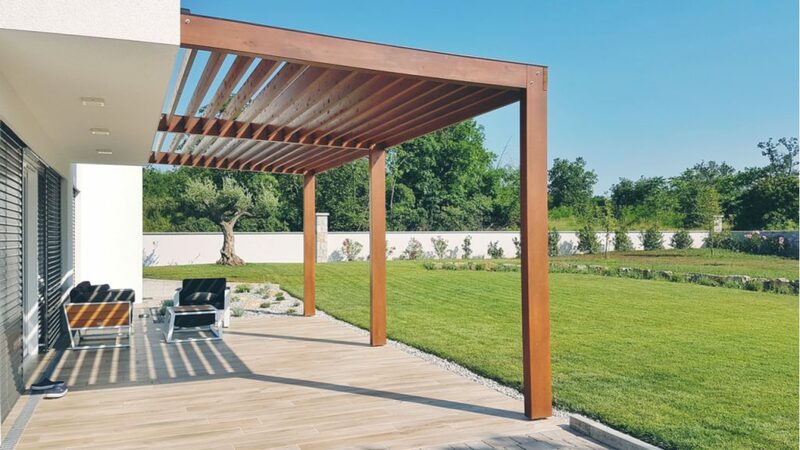 Because most pergolas use rugged stained cedar, the structure can withstand weather and provide structural integrity for 15-20 years if maintained properly. Re-staining every three or four years typically is the only maintenance requirement. Chris Lee, president of Earthworks, says pergolas can be built for just about any type of covering and offer property managers another amenity to attract new residents and retain others. They can be covered with natural greenery or lightweight screen, breathable polyethylene or canopy-type materials to provide shade and deflect heat. Pergolas are distinctive and may seem to be an ultra-modern amenity, but they’ve been around for hundreds of years. Early examples of pergolas date to ancient Egyptian times, and Italy is known for building the structures as far back as the 1600s. Most were built with creeping vines to provide shaded areas, a practice that still holds true today. He cautions that anytime plants grow on pergola they could cause long-term damage because of the moisture that gets trapped between the wood and plant. Re-staining also becomes an issue. Lee recommends that any vines or plant life growing on the pergola be maintained so it doesn’t get out of control. Because of their simple design, pergolas can be retrofitted to pool areas and patios. Earthworks recently installed one that partially covered a pool, providing relief from the heat for residents at one apartment community. Size doesn’t necessarily matter either. Pergolas can sprawl across large patios or be reduced to a small area of the backyard with seating. Drapes can provide a semi-private area while still allowing for air movement from the top. The floor can either be made of grass, stone or rock. “There’s so much you can do with pergola,” Lee said. “In the grand scheme of things, they are not crazy expensive, and it’s something anybody can do as long you have a 12’ x 12’ area. That’s all you need.